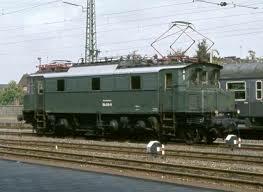 This Electric Locomotive was designed for medium heavy Fast Train passenger service. Only 38 samples were built, in 1928 and 1929. Top speed was in the vicinity of 72 mph. She could also climb quite well, but at a slower speed, of course. She was an upgrade to her forerunner, the relatively successful E 21. Even though she performed rather well, she did not attain any particular fame; flamboyant she was not, but she was reliable and very durable. In her own rights, she was appreciated and somewhat popular in some areas. Drive wheel coupling rods were absent, but she still had pilot and trailer axles. The axle configuration was 1’Do1’. 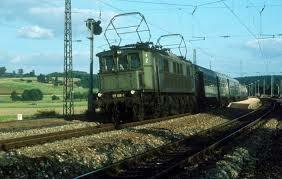 Right from the start, the E 17s were assigned to various areas throughout Germany. She had to go wherever she was needed. She saw service in the central region, Silesia and the Southwest. Notably, one of them was transferred to Munich, Bavaria where she had the lofty honor to handle Special Trains attending to the famed ‘Oberammergau Passion Plays’, a notorious annual theater event which attracted large audiences. After 1933, a lot of them were transferred to the Stuttgart-Um area. After the turmoil of WW II, two of them were in service in East Germany. In 1968, both were retired and junked. The West German DB inherited 26 of them. In 1960/61, all of them were rebuilt and modernized. 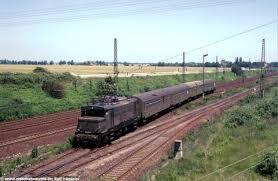 In 1968, they were re-designated E 117. Their primary assignment was to haul passenger trains in the Munich-Nuremberg-Ulm areas. The last one retired in 1980, after 52 years of service. Her beauty lies in the eye of the beholder. I think she is very handsome. These days, Maerklin offers a very nice model of the E 117. This one has an mfx+ decoder, something to think about. Trix has the DC 2-rail version. I am not aware of anyone else making a model of this locomotive.